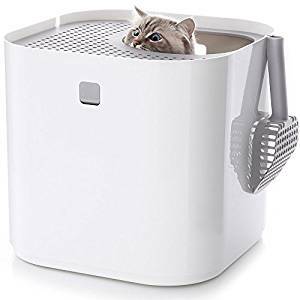 For those looking for the value, this ScoopFree Self-Cleaning option is the best automatic litter box. Although not very fancy, it works and does all for you at an affordable price. This system is easy and simple to setup. Just insert a disposable tray under the litter box to start. 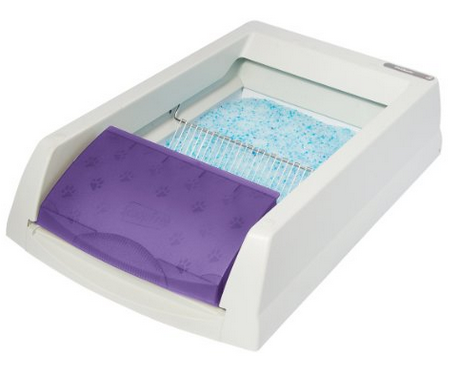 This tray is filled with unique blue crystals that perform better than other clumping litters available most litter boxes. These blue crystals absorb urine and dry them out into the solid wastes that are better than other clumping litter and it has better odor control. It also allows you to set a timer (5, 10, 20 minutes after) to when the system will activate when your cat is done. The system then scrapes litter into a chamber that is sealed. This chamber neutralizes the inside odor. After every 20 or 30 days or so (depends on how frequent your cat uses it) you must swap out the whole disposable tray with new one. So you don’t need to scoop the tray every day. These crystals within this ScoopFree system are better than clumping litter or generic clay because one tray of these blue crystals lasts for 30 pounds of generic litter. So it performs better to control the odor and handle urine as well as solid wastes better. As they look like a rock with pleasant scent, you can keep it in your room. The area of litter box is just 14 X 14 inches square which suits to most cats. The ScoopFree litter systems comes in the semi-automatic category because disposing and replacing the tray is at user’s part. 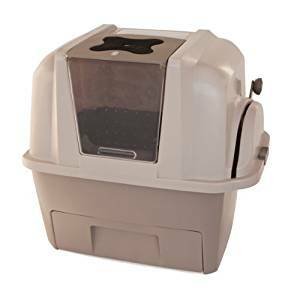 It is a simplest of all automatic litter boxes which works well. It comes with 90 days money refund guarantee so if your cat doesn’t like crystals or completely reject it you get your entire amount back. If you like something fancy than the Cat Genie automatic litter box is best one. It connects into your toilet and gets completely integrated within your drainage system. 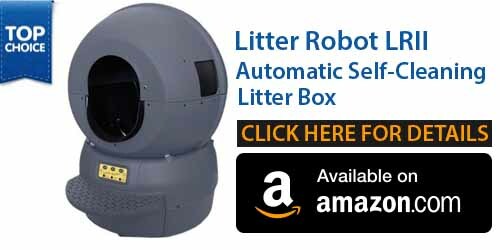 It is the perfect and complete hands free solution for cat’s litter problems issues. It features washable granules that do not need replacement. However it will be better to replace them after every 3 to 4 months. It is completely automated flushing device that disposes wastes down your toilet drain. It is easier to install and setup. Just attach the T-adaptor to the water supply in 2 different places and all set. It works automatically and you don’t need to touch it again. As soon as cat finishes it, automatically disposes liquid as well as solid wastes. For liquid wastes, it seeps to the bottom of the box and mixes with the drainage pipe. For solid wastes it automatically collects and dissolves it with a sanitizing solution and flushes it through your drainage system. After this, whole toilet and granules are washed with sanitizing solution and water. All of this is completed within 30 minutes to an hour. It allows you to set a timer to trigger the flush process after the cat leaves. Self washing granules are good but they get dirty and smelling after every 3 to 4 months, so you need them to change. However the company suggests not changing it, just flush it again and try it. As most of the cat likes to play in the toilets and therefore there is a chance that granules spill out and gets all over your floor and can become bothersome to clean it up. Generally, Cat Genie is one of the quality products that minimize your work. The Litter Robot is the one of the coolest automatic litter boxes in the market. It is designed to give cat some privacy while they use the toilet. It also avoids spilling out of granules. Operating this machine is also very easy and simple. As soon as your cat finishes the toilet, the system and gathers wastes at bottom of the trash bags. As it is a simplest device, there is sound complex engineering behind this system. The way it rotates and disposes the waste is amazingly effective and it removes the entire wastes in an effective manner. 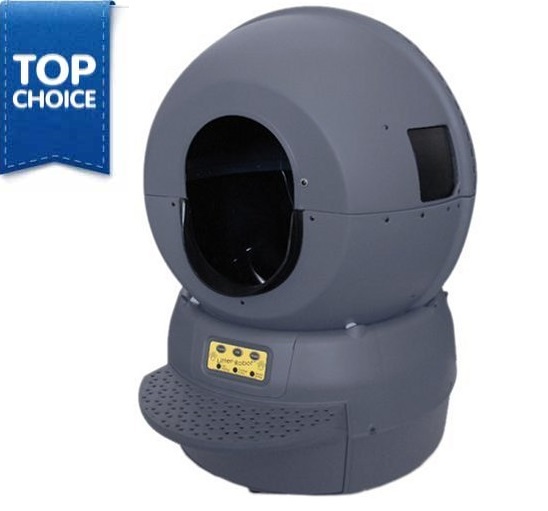 The dome as well as rotation mechanism is far better as compared to the standard rake that is available in typical cheaper automatic systems, where it tends to spill some of granules or doesn’t do an excellent job to pick up 100 percent of the wastes. But, with this Litter Robot, there is something with the science of this gadget that disposes all the waste perfectly without leaving any mess inside or around dome. 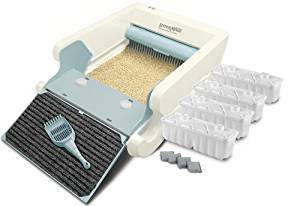 For a cat owner who has ever used any average litter box can understand how annoying is to clean their floor completely messed with granules and a bad smell it produce. The best part in this device is its attention to the details. It can be set to automatically activate a few minutes after the cat leaves. There are high-tech pressure sensors that identify when the cat is in and out. It automatically shut down if your cat tries to jump back. 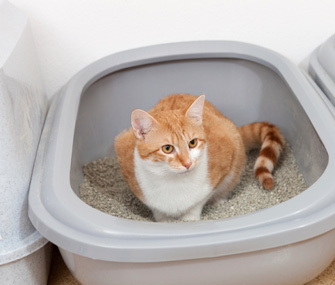 With other typical rake based litter boxes the cat can play around and break it or spill the granules. As the Litter Robot device is enclosed, it is not easy for the cat to play inside it and therefore there is least chance to spill many granules on floor. It has cool sleek design and it is built similar to a tank and made up of solid materials. Your cat will fall in love with Litter Robot and you will find it easy to train the cats for how to use it. If you can pay top dollar for convenience, durability, and design go for the Litter Robot. It is backed up with 18 months warranty and a complete money back guarantee for 90 days if your cat reject it. Omega Paw Self-Cleaning Litter Box is something just what you are behind! It never breaks down, it does not need any electricity, it keeps rolling over and over again. 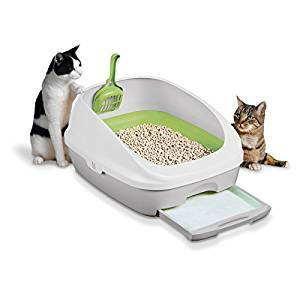 Stay free from the sparing money and headaches by getting this wonderful self-cleaning cat litter box. The best thing it is easy to setup, clan and use. It is best for multiple-cat and big cat households. This big Omega Paw Self-Cleaning Litter Box rapidly clean automatically and at the same time control dust and odors as well. 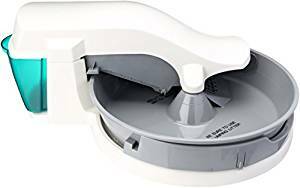 It allows you to clean in just few seconds and it doesn’t need any scooping! Moreover it needs less litter as compared to other traditional cat litter box and its scoop just collects the clumped waste and cleaned litter doesn’t need to be thrown away. It performs best with silica and clumping litters. Just roll it to right till its top touches the ground and after this roll it back to upright position. A unique patented screen separates clean litter from clumped waste and put all waste in the scoop. Draw the scoop and then dispose waste. Believe it is that easy! The internal mechanism of this litter box deposits clumped waste in pullout tray to make disposal as easy as 1, 2 and 3. 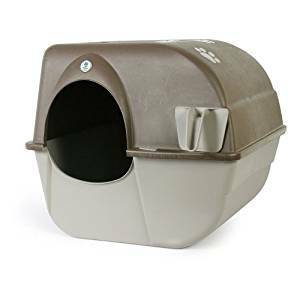 It makes it easier to give your cat a clean litter box as well as privacy because of its covered pan design. It saves you money because you don’t need any extra scoops, filters or liners to buy. With silver top and as base in blue color, its dimensions are 19-1/2 x 22 along with 9 by 9 inches opening to provide more room for bigger cats and multiple cats. 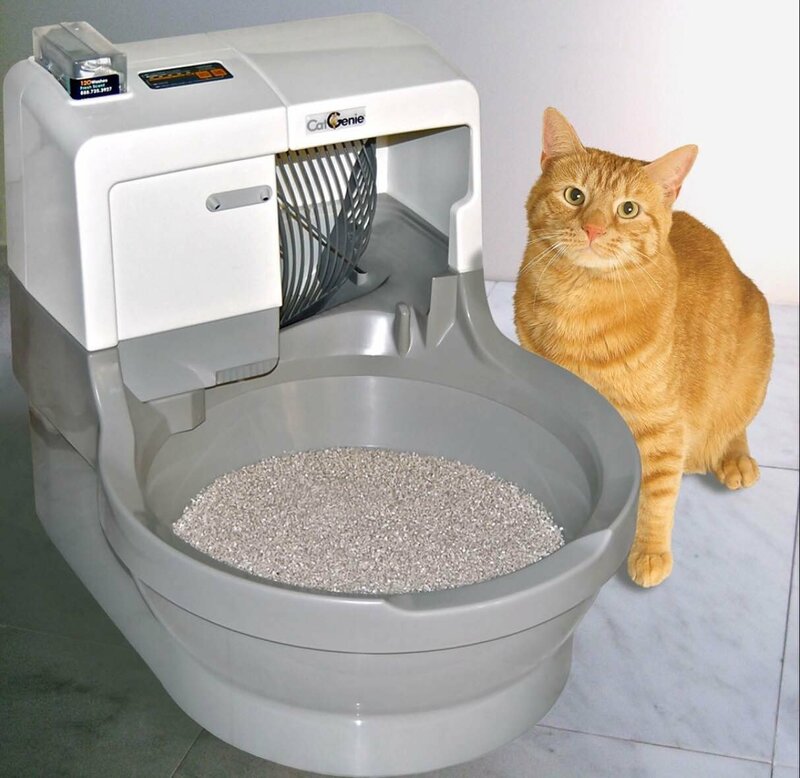 This innovative self-cleaning cat litter box is environmentally and economically friendly as well. 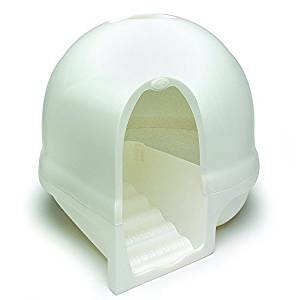 You need no extra accessories to maintain Pet Safe Litter Box. You can conveniently use it recycled grocery bags in order to line the waste for affordable yet quick cleanup. No doubt, this unit is not just easy on your wallet, but also easier on you and your pet. The best thing it is easy to setup, clan and use. You need no scooping, no mess and no odor. It saves you precious time because it is completely automatic. It is quite pleasant to your cat because it is always ready and fresh and you don’t need any schedule. You will be amazed to put finger on rim of bowl in order to ensure it is really working or not. There aren’t any visible moving parts to catch your cat tails and paws, therefore there is no worries for your cat when it is using it. Its waste bin can be lined with grocery bags for easy cleanup. It is best suited to the cats weighing 15 pounds or less. You need to be careful that tab on litter guard is protected under conveyor, otherwise, it may cause popping sound. Keep litter at fill line point in bowl. Using too much or too little of litter can cause problems with motor. Remember to only use clumping, clay litter.